More Home than Home: There are endless reasons we all fall for the mountains, but one enchants us above all others: This place feels like home in our hearts. Here, five writers share how their deep connections to these hills were forged with Sunday drives, old-time music, wildflower hikes, and through the discovery of inspiration and strength. As a boy growing up in Greenville, South Carolina, I thought of the mountains of Western North Carolina as a place to go for a ride, a Sunday afternoon respite from the stifling, humid, uneventful landscape of the Piedmont. My family would pile into our nearly new ’63 Biscayne, our father driving the old U.S. 25, a winding, shady back road that gradually gained altitude, taking us along creeks, past waterfalls, through the Greenville watershed, along the Green River, and through little towns such as Tuxedo and Flat Rock. We rode with the windows down, breathing in the cool, moist air that somehow seemed lighter and richer. Even then, I preferred shade to sun, cool to heat, forests to fields, so these Sunday afternoon excursions into the mountains felt like visits home. When I was a sophomore at Furman University, my parents gave me that same Biscayne, which was 10 years older and, by that time, burned as much oil as gas. In fact, one mechanic, finding the bolt to the oil pan stripped, simply soldered the thing shut. Still, it was transportation, and on Saturday evenings in the summer, I would drive up U.S. 276 in the direction of Brevard. 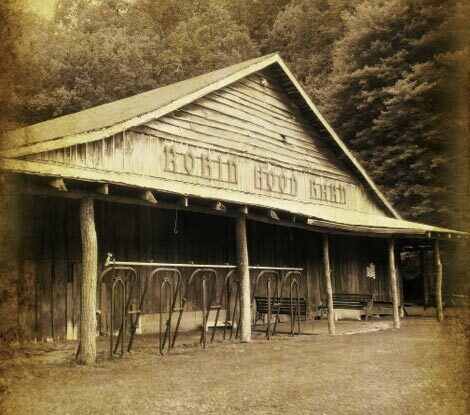 I’d drive over Caesars Head along a steep switchback section of road, and then coast down the other side into North Carolina and the town of Cedar Mountain, where square dances were held at Robin Hood’s Barn. The ride up was always iffy. I had to put the Biscayne in low gear for the climb over Caesars Head, and the car would often overheat. I kept milk jugs in the trunk so I could scramble down the mountainside, bushwhacking through rhododendron and mountain laurel to fill them from a creek, and then scramble back up to refill the radiator. The couple of times I was lucky enough to find a date for the square dances, the girls were good sports and even helped me fill the jugs. Still, when their parents heard about our adventures with the Biscayne, they refused to let them ride with me to the barn again. I didn’t see what the big deal was. To me, it was part of going into the mountains, a price I willingly paid to listen to banjo and fiddle music I’d never heard and dance with girls I’d never met. The music and dance lifted my spirits in a way that nothing ever had. If for only a few hours, I felt connected to a place and to people in a way I never had down in Greenville. A few years later, I took a job editing the Tri-County News in Spruce Pine, a place that appealed to me because it was deep in the mountains, a place that felt, at least back then, that time had nearly forgotten. The highlight of each week was driving the winding road to Micaville on Friday evening where square and contra dances were held at the little stone elementary school. I’d meet up with friends from Mars Hill and we’d dance to eerily beautiful old-time music. One guy named Bruce Greene, who is now known as a master fiddler, played so achingly well that goose bumps would rise on my arms and a tingle would travel along my scalp. I was downright transported. Of course, it didn’t hurt that I frequently danced with a lithe, high-cheek-boned, dark-haired girl, with whom I was so struck I could never think of what to say to her. From Atlanta, she’d attended Mars Hill College for the same reason I was attracted to the mountains: She felt at home here. That dark-haired girl has been my wife now for nearly 32 years. We spent the first 10 years of marriage in places up and down the East Coast, but when we decided it was time to have a family, there was no question—we returned home to Western North Carolina. We have two nearly grown children and live in Asheville. And ever since the children were toddlers, we’ve been riding up into the mountains on Sunday afternoons, but unlike the drives of my childhood, we get out of the car and go for a hike. Tommy Hays is the author of the novels, The Pleasure Was Mine, In the Family Way, and the forthcoming What I Came to Tell You. He is the executive director of the Great Smokies Writing Program and a lecturer in the Master of Liberal Arts Program at UNC Asheville.